The Ryder Cup may have just kicked off but AMH have had their own Golf Competition in the beautiful setting of Warrenpoint Golf Club. 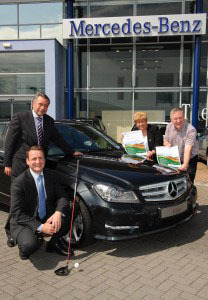 Organised by the staff and clients of AMH Newry & Mourne with the help of Newry Employer’s Forum and sponsored by McKeown’s Solicitors, nearly thirty four-balls took part and there were plenty of prizes up for grabs – including a Mercedes for a hole in one! The weather was on our side – with not a drop of rain, but the wind on the 6th proved to be too tough for the those competing for the Mercedes – better luck next time! 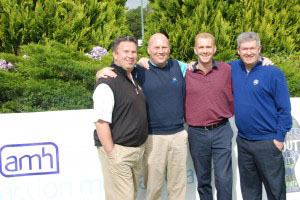 Golfers were treated to a BBQ at the 9th and dinner and entertainment at the 19th! Thanks to all those who took part, to all those who sponsored a tee box, donated prizes, gave up their time to organise and help out, to Agnew Mercedes Portadown and our sponsors McKeown’s Solicitors. All money raised will be used to continue the work AMH New Horizons do to enhance the quality of life and employability of local people with mental health needs. 1st place: Confederation of Communities Groups; Raymond Jackson, Larry Mc Alinden, Peader Gallagher and Italo Catuila – Prize: 4 Ball Lough Erne. 3rd Place : Glen Electric; Paddy O Gorman, Raymond Mc Parland, Kieran Mc Parland and Martin Bagnal – Prize: 4 Ball Barmoral Golf Club.